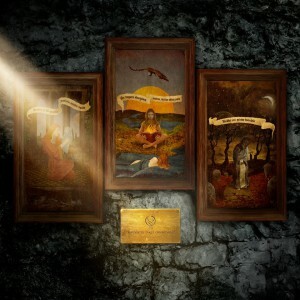 Pale Communion is the eleventh studio album and third progressive rock outing by Opeth. Following on from the Damnation and Heritage albums, Pale Communion sees Opeth once again exploring their progressive rock influences without any traces of their death metal side which thankfully excludes the grunts and growls too. There is also some jazz fusion influence creeping in, which could be due to co-producer and guest backing vocalist Steven Wilson (Porcupine Tree, solo) following his own taking to the genre in the last few years. After appearing in a guest role on Heritage’s title track, keyboardist Joakim Svalberg has now joined the ranks of Opeth as a fulltime band member following the departure of Per Wiberg (Spiritual Beggars). The overall sound of Pale Communion is most easily described as a continuation of what is heard on Heritage. The big differences are that Opeth are more confident in embracing their progressive rock roots and the songs are more fine-tuned with many of them having a longer running time to reflect this. Like many of the songs on Pale Communion, Cusp of Eternity has a myriad of passages woven together seamlessly but for no reason it ends with a fade out. Given how many directions some songs on Pale Communion take, it almost comes across as Opeth brushing it aside for the ambitious 11 minute Moon Above, Sun Below, which does not feel like it’s half as long as it is. Still not content with their new sound, Opeth takes a breather on Elysian Woes by introducing elements of folk music and keeps a steadier pace to bring Michael Akerfeldt’s voice to the front. River is written in the same vein with a stronger emphasis on vocal melodies (which is another major addition to the album that gets its biggest spotlight on Faith in Others) and has a bit of a jam session part way through to mix things up even further. Goblin tips its hat to the Italian progressive rock outfit of the same name and is the only instrumental track on Pale Communion. It centres around a steady build up and drummer Martin Axenrot throwing in plenty of short and sharp fills to keep you on your toes. With all the songs before Voice of Treason being much lighter by comparison, it takes an uncharacteristically tense twist that is reminiscent of the song Closure from Opeth’s 2003 album Damnation. The atmospheric keyboard work at the end bridges it with Faith in Others to create a 16 minute 2 part song. The complete lack of heavy metal will be a disappointment for long-time fans that haven’t embraced Opeth’s progressive rock side but for the rest of us, it’s another exciting chapter in Opeth’s discography as well as the modern progressive rock scene as it seems that Opeth has its collective heart set on this path for the time being.